Every time a new hearthstone expansion or adventure drops, it has the potential to shake up the meta, but the Whispers of the Old Gods expansion isn't just going to add a bunch of wacky cards, it's also going live at the same time as the wild vs. standard split, which means we're going to see a completely unprecedented shift in what decks are strong and which aren't. While it's too early to tell for sure about everything, we can make some guesses as to how Whispers of the Old Gods will change the current hearthstone meta. Here are some predictions about what's going to be different once April 26th rolls around. There are some exceptions, but a lot of the new cards that have been revealed -- like C'Thun, Cho'Gall, and Deathwing, Dragonlord -- are big hefty minions with essentially game-ending effects, which means that classes that can survive long enough to play a 10-mana behemoth will have an advantage. Additionally, a lot of sticky minions and cheap removal that made big minions unviable will be phased out in standard; combine this with hints from Ben Brode that hard removal cards like Ironbeak Owl and Big Game Hunter may receive nerfs or tweaks, then control decks start to look really strong. If cheap, neutral removal options go away or are nerfed, then classes with inherent strong removal -- like Mage polymorph, Shaman hex, Warrior execute, etc. -- are going to be a lot more powerful. 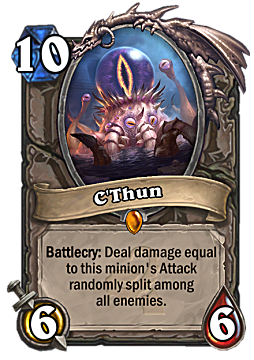 If your opponent manages to drop a buffed C'Thun or an Ancient One, you're essentially done for if you don't have easy removal. It's too early to tell for sure which decks will be strong, and zoo/aggro decks aren't going away any time soon, but there are some good indicators that Control Paladin, Wallet Warrior, and Freeze Mage will get bumps just from the need for good control options. 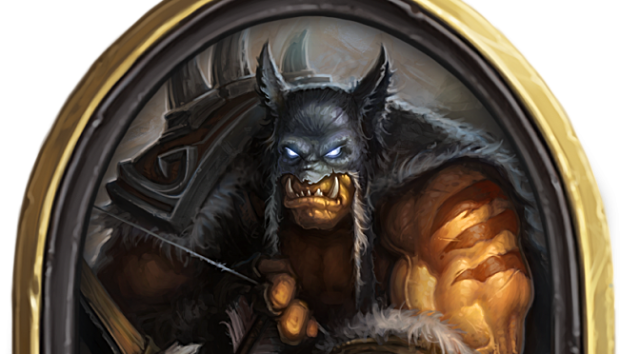 Depending on your play style and your tolerance for wackiness, hearthstone's reliance on RNG is either fun or infuriating -- if you're the latter, then you are probably going to be disappointed with the expansion, because Blizzard has gone all-in on the RNG with cards like Yogg-Saron, Hope's End, Shifter Zerus, and Spreading Madness. It's hard to say which classes can benefit from RNG because, well, it's random, but it seems like this benefits control as well. Any class that can stabilize the board after wackiness ensues is going to do ok even when the dice roll badly. Not to mention that with cards like Yogg-Saron, the math actually tends to favor you once you've cast a lot of spells, so a Freeze Mage dropping this late in the game is going to get a net benefit most of the time. Classes that rely on specific board conditions and reliable combos will probably not enjoy RNG as much, and fast decks aren't going to want to risk a bad outcome, but this seems like a wash, for the most part. This is unlikely to last forever, but a lot of the cards that players used consistently to combat zoo and aggro decks are going away in standard, so it will definitely take time for the meta to adapt. What are your thoughts? Have a prediction about what's going to be the next big thing in Whispers of the Old Gods? Let us know in the comments!